Blogspiration! My new favorite word. I've rounded up nine of my all time favorite blogs that have breathtaking photography, creative posts and, after following along for years, inspired me to start my own blog. If you're a blogger, these sites will seriously fan your passion flame. And if you just love to follow blogs, this list will introduce you to some new ones or, if these are your favorites as well, lead you to some especially stellar posts you might have otherwise missed. 1. How Sweet Eats. There literally aren't enough complimentary adjectives to describe Jessica's blog. The photography is insane, but at the same time very approachable in a way that makes you feel like you could actually replicate the amazingness you're seeing on your screen. Although she's not a plant-based cook, she often posts vegan recipes and many of her dishes with meat or dairy can be adjusted with a little creativity. She recently posted this recipe for Vegan Coconut Banana Shakes that literally made me stop mid scroll on Instagram and immediately visit her site to pin it. 2. Cupcakes & Cashmere. She's been called the Martha Stewart of our time and no blogspiration list would be complete without her. Emily's lifestyle blog covers fashion, food, home decor and DIY. She's also a posting machine, cranking out two a day, which means there's always something new to look forward to when you visit. She recently revealed how she decorated her new downtown LA office in one of my favorite posts to date. 3. Minimalist Baker. All of Dana's recipes require 10 ingredients or less, 1 bowl/pot or 30 minutes or less to prepare. The majority are also plant-based and gluten-free. She's a girl after my own heart when it comes to delicious, veggie filled food that doesn't require a laundry list of ingredients or dozens of steps, naturally making her one of my go to's. This recipe for Vegan S'mores Whoopie Pies is such a fun twist on a classic summer favorite. 4. Deliciously Ella. Ella's plant-based blog has taken her to some truly incredible places. She has several cookbooks, an app and just recently opened her own Deli, all sparked from the success of her blog (how's that for inspiration?). Deliciously Ella recipes are gluten-free, include whole, unprocessed foods, no refined sugar and have very simple instructions. This recipe for broccoli soup is one of the most delicious soups I've ever had (really). 5. The Balanced Blonde. 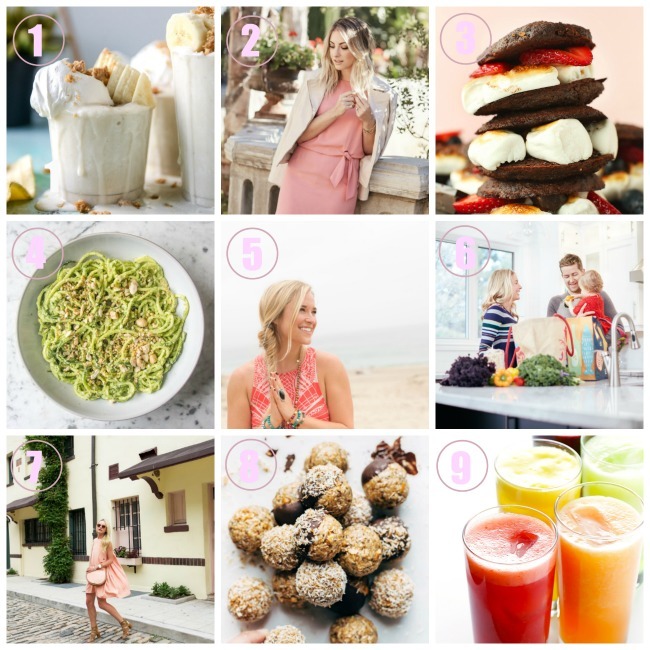 Jordan is in pursuit of all things health and wellness, and takes her readers along for the ride with posts on fitness, food (including many delicious plant-based recipes) and travel, just to name a few. She has an incredible voice that makes you feel like shes your BFF talking directly to you. When I'm feeling frazzled or worn out, I visit Jordan's blog for a reset and always walk away in a more positive mood. I found her recent post on how to find your mantra especially inspiring. 6. Oh She Glows. This is the first food blog I ever started following. Angela posts all vegan recipes with some of the most inspiring food photography I've ever seen (if you dont believe me, just check out some pages from her new cookbook). She recently posted these No-Bake Chocolate Fudge Cookies that are not only delicious but super simple to make. 7. Atlantic Pacific. This is actually the first blog, period, I ever started following, and it was so fun to watch it grow into the huge success it is today. Blair posts to die for fashion images with nothing but a witty title, proving that, if writing isn't your thing, you can be successful letting the images speak for themselves. Her recent post in this peach dress complete with a matching bag and sunglasses got me so excited about summer. 8. Pinch of Yum. Lindsay is the mastermind behind this delicious recipe blog that includes tons of healthy, vegan meals and always has entertaining stories to go along with them. But it's really the team she makes with her husband, Bjork, that I find so inspiring. Bjork runs Food Blogger Pro that includes a weekly podcast about the business behind food blogging, which Lindsay is often a guest on. It's been so much fun to get a behind the scenes look at how Lindsay built her super successful blog with Bjork's help. My most recent favorite from her site is General Tso's Cauliflower, which was a bit more time consuming than most of her recipes, but completely worth it. 9. Gimme Some Oven. Ali embraces a minimalist style with both her food and photography. She keeps her recipes simple to let the ingredients really shine, and shoots them in white or glass dishes on all white backgrounds. These are very unforgiving conditions when it comes to food photography and yet, the girl posts breathtaking, mouthwatering images on the reg. Nothing short of inspirational. Her recent post for Naturally-Sweetened Agua Fresca makes me happy just looking at it. So amazing blogs, nice post! Wonderful blogs. thanks for sharing. I'm so glad you enjoyed them, Maria! Thanks so much for sharing this list. I was only familiar with 2 of them, so I appreciate getting to know some new fellow bloggers. Loving this list, Julia! Some of my favorites are on here too, and you helped me to discover a few new ones as well. Nothing better than finding a new favorite read! Yay! I'm so glad you were able to discover some new blogs, I couldn't agree more that finding new reads is one of the most exciting things! Superb list. thanks for sharing. That's great! I'm so happy you discovered some new ones. These are my all time favorites and I think you'll love them as well.